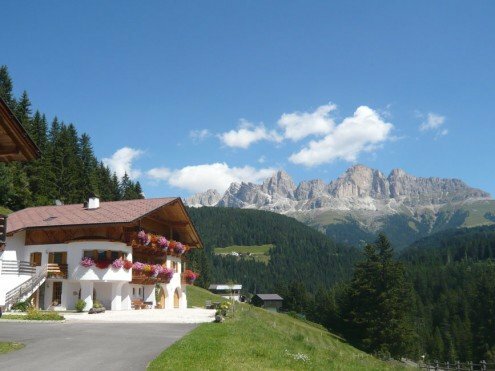 Your farm holiday in the Dolomites on the farm Karerhof will take you to the romantic and pristine holiday region of the legendary Catinaccio and Mount Latemar. The bizarre mountain peaks are part of the UNESCO World Heritage Site and have an incomparable aura. The farm Karerhof with ist four comfortable holiday apartments is located at the foot of the mighty massif at 1,450 meters above sea level. With the fabulously located Lake Carezza, you will discover one of the most beautiful Dolomite lakes near your accommodation. Explore the natural landscapes of the Catinaccio region on varied hiking or biking paths starting right from the farm. Enjoy a leisurely walk on the Elisabeth Promenade and a hike around Lake Carezza. At the canyon “Bletterbach” and in the Natural Park Monte Corno you will experience the natural power of nature on beautiful excursion trails. On numerous theme paths during your holiday in Nova Levante you may learn all about the myths and legends of this Dolomite region. 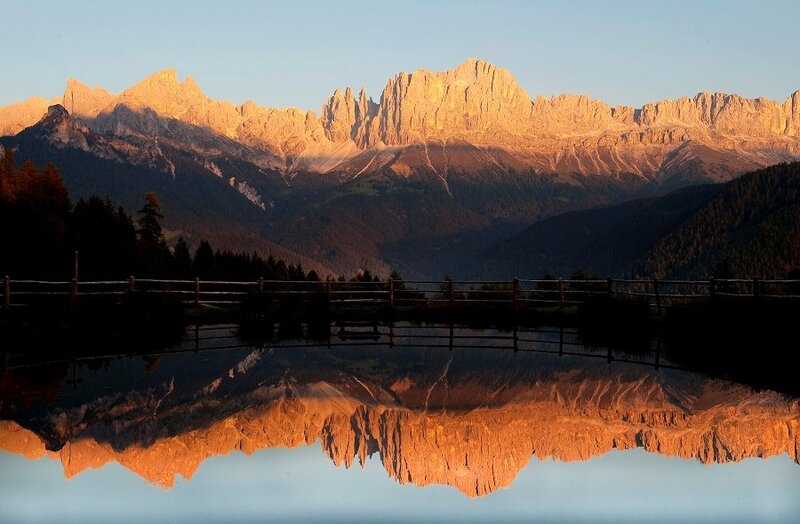 Starting directly from the farm Karerhof, an exciting excursion will lead you to the famous rock labyrinth of Mount Latemar or to Lake Carezza. Your farm holidays in the Dolomites will be spent in the comfortable quality apartments on the farm Karerhof. 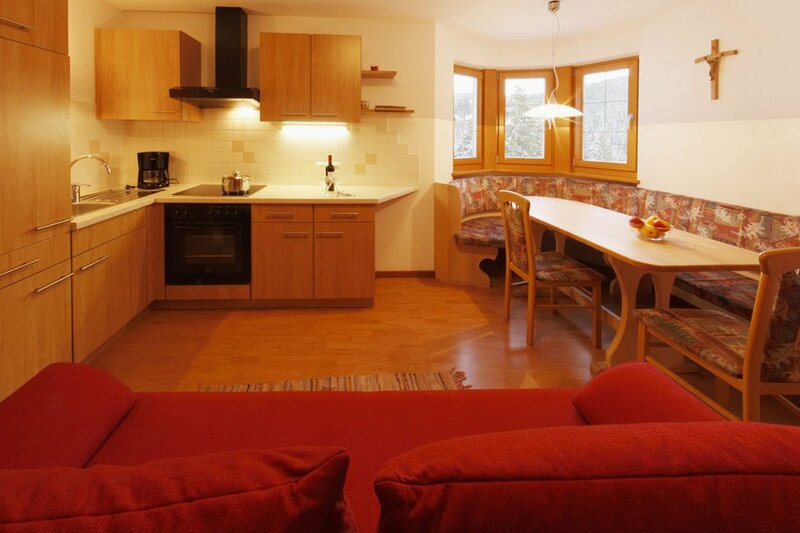 The holiday accommodations offer room for 2-4 and 2-5 persons; they are finished in wood from local forests. In addition to a spacious bathroom with shower, bath, bidet and WC, you will find a fully equipped kitchen unit, a living room with satellite TV, a comfortable dining area and a bedroom with double bed. Upon request, your hosts will provide delicious farm products. Enjoy home-made jams, bacon, vegetables, eggs, juice, teas, potatoes and herbs at the farm Karerhof. Only five minutes by car from your holiday apartment you’ll find the ski area Carezza, one of the most traditional and sunniest ski resorts in South Tyrol. 40 km of slopes and 17 km of cross-country trails guarantee fun holiday weeks during the winter season. 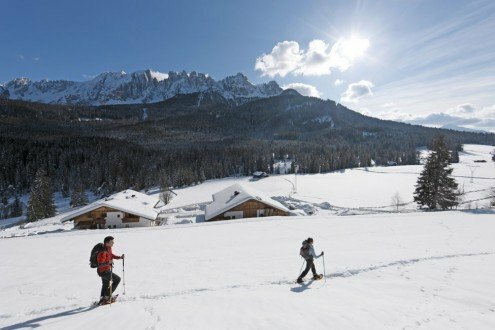 With the ski area Latemar-Obereggen another ski resort – part of the Dolomiti Superski network – is just a short drive away. Snowshoeing, toboggan runs and ice skating rinks guarantee variety also away from the ski slopes. A trip to the city of Bolzano with the Ötzi Museum and the Messner Mountain Museum is a cultural experience in every season. The spa city of Merano with its historic castle Trauttmannsdorff is also worth a visit.